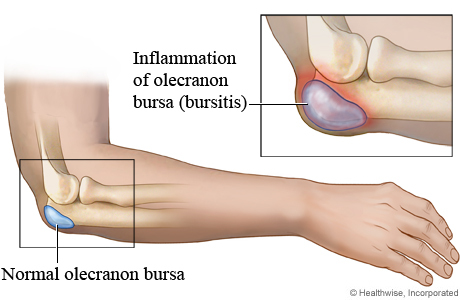 How do you heal OLECRANON BURSITIS? This is a chronic inflammation of the olecranon bursa. It may be the result of repetitive minor injuries or irritation, microcrystalline deposition. Infection occurs due to chronic friction as in students who tend to keep their elbows repeatedly over the table, bench, etc. over long periods during writing, reading, etc. It usually manifests as a swelling over the tip of the olecranon. There may be pain, if there is inflammation. Inspection or palpation usually easily detects it. Aspiration and culture of the bursal fluid are necessary in order to exclude the possibility of an infectious etiology. Treatment is essentially conservative and consists of NSAIDs, local steroids, etc. Surgical excision is done in chronic cases. Microcrystalline-induced bursitis has a good prognosis and the symptoms usually resolve after a few days, whether treated or not. However, bursitis due to repeated minor irritation is more difficult to treat. How to cure Ankle Tibial Nerve? Stress fracture of the medial malleolus is an unusual injury but should be considered in the runner presenting with persistent medial ankle pain aggravated by activity. Although the fracture line is frequently vertical from the junction of the tibial plafond and the medial malleolus, it may arch obliquely from the junction to the distal tibial metaphysis. Athletes classically present with medial ankle pain that progressively increases with running and jumping activities. Often they experience an acute episode, which leads to their seeking medical attention. 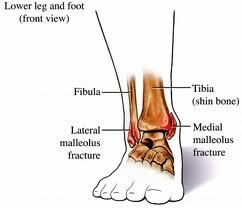 Examination reveals tenderness overlying the medial malleolus frequently in conjunction with an ankle effusion. In the early stages, X-rays may be normal, but with time a linear area of hyperlucency may be apparent, progressing to a lytic area and fracture line. If the X-ray is normal, a radioisotopic bone scan, CT or MRI will be required to demonstrate the fracture. If no fracture or an undisplaced fracture is evident on X-ray, treatment requires weight-bearing rest with an air-cast brace until local tenderness resolves, a period of approximately six weeks. If, however, a displaced fracture or a fracture that has progressed to non-union is present, surgery with internal fixation is required. Following fracture healing, the practitioner should assess biomechanics and footwear. A graduated return to activity is required. How Foot and Ankle Discomfort is treated? 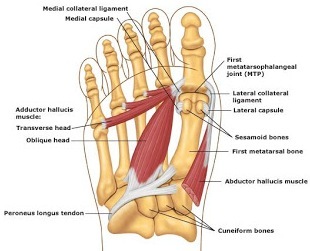 Hallux Valgus is defined as a static subluxation of the first metatarsophalangeal joint. It is characterized by valgus (lateral) deviation of the great toe and varus (medial) deviation of the first metatarsal. Bony exostoses develop around the first metatarsophalangeal joint, often with an overlying bursitis. In severe cases, exostoses limit first metatarsophalangeal joint range of motion and cause pain with the pressure of footwear. Excessive pronation-increased pressure on the medial border of the hallux, resulting in deformation of the medial capsular structures. Others-cystic degeneration of the medial capsule, Achilles tendon contracture, neuro-muscular disorders, collagen deficient diseases. In the early phases hallux valgus is often asymptomatic, however, as the deformity develops, pain over the medial eminence occurs. The pain is typicaIly relieved by removing the shoes or by wearing soft, flexible, wide-toed shoes. Blistering of the skin or development of an inflamed bursa over the medial eminence may occur. In severe deformity, lateral metatarsalgia may occur due to the diminished weight-bearing capacity of the first ray. Examination reveals the hallux valgus deformity often with a tender swelling overlying the medial eminence. Plain X-rays should be performed to assess both the severity of the deformity and the degree of first metatarsophalangeal joint degeneration. Initial treatment involves appropriate padding and footwear to reduce friction over the medial eminence. Correction of foot function with orthoses is essential. In more severe cases surgery may be required to reconstruct the first metatarsophalangeal joint and remove the bony exostoses. Orthoses are often required after surgery.